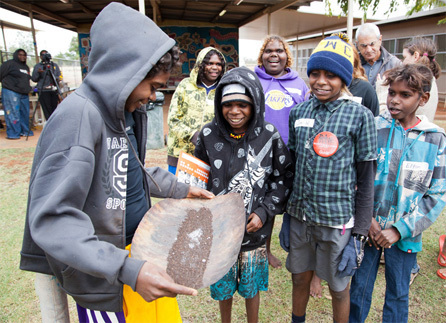 Jigalong was the fifth stop for Marnti warajanga’s tour of the Pilbara. 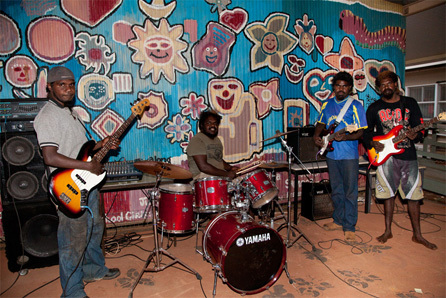 The exhibition reached Jigalong on 5 June 2012, seven weeks after departing Canberra. On its way the exhibition visited South Hedland, Warralong, Yandeyarra and Newman. Upon arrival, the exhibition team set up in the grounds of Jigalong Community School. Over three days the team met and worked with the students and teachers at the school, displaying the exhibition and running photography workshops. A community celebration was held at the school to welcome Marnti warajanga on the evening of 7 June. A group of local men formed a band for the celebration, the museum staff cooked a BBQ and the people of Jigalong came out to celebrate and share their knowledge of their history. To increase community participation and to document the museum’s visit to Jigalong, the museum commissioned young film maker Curtis Taylor (who features in the exhibition) to make a short film of the activities, assisted by Bernice Samson and Natrisha Wongawol. Jigalong community film, Prevailing Wind Productions. Still images by Tobias Titz. After three very full days, the exhibition team headed back to Newman to share the exhibition with staff of BHP Billiton. They then returned to South Hedland to hand the exhibition over to Wangka Maya Pilbara Aboriginal Language Centre for future display.